Bratislava is well known to travelers as a quaint day-trip city, whether via the structured tour group wandering around Old Town or for the adventurous types making their way here from surrounding tourist destinations. While we disagree that BA falls into the eight-hour experience category, it is true that the city offers many activities that can be enjoyed by locals and tourists alike in a single afternoon. 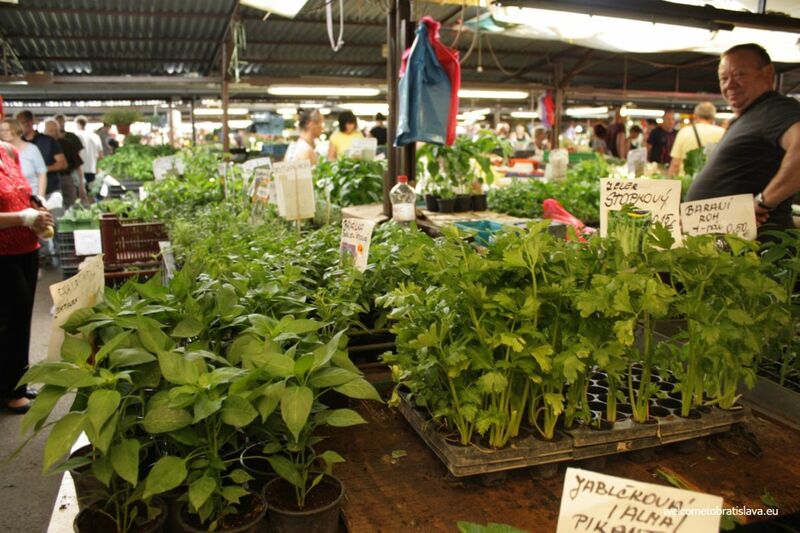 One of our favorite ways to spend an afternoon is at a classic market. 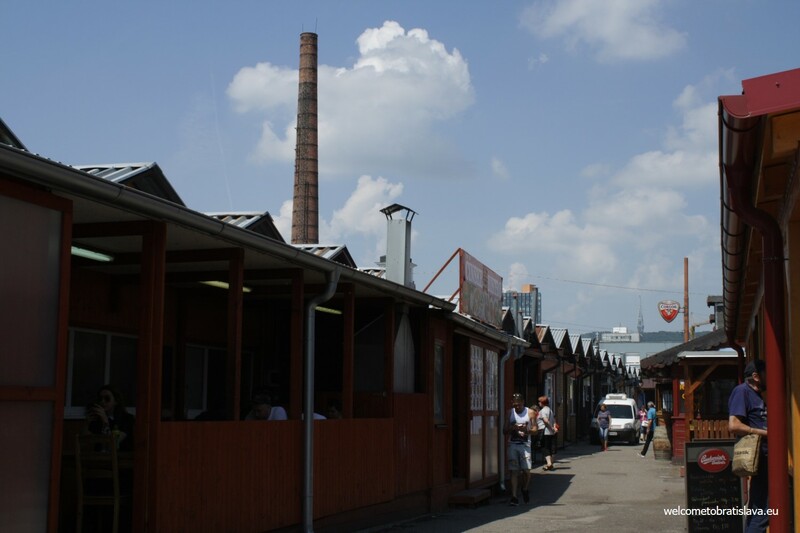 The historic Miletičova market – or Miletička – is noteworthy for maintaining that prototypical Socialist-era farmers market atmosphere, while adapting to the ever changing demographics and trends of a modern capital city. 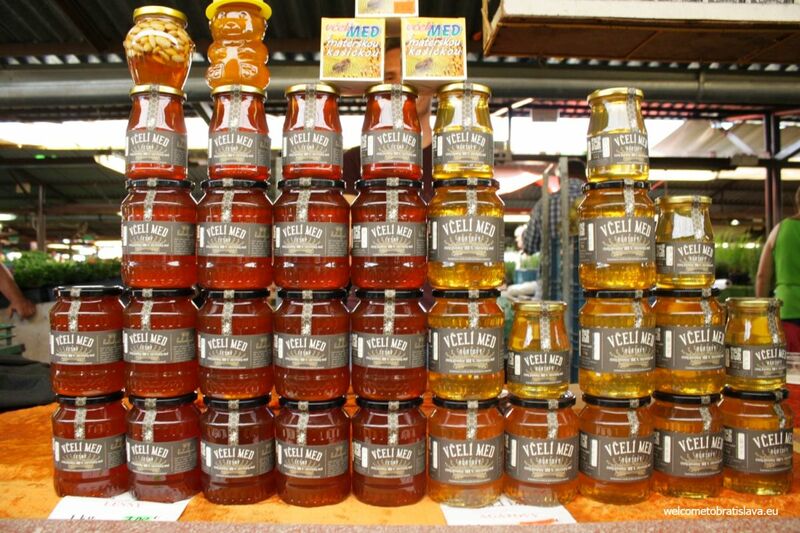 Every local knows this market, but it deserves to be on the radar of savvy tourists. Miletička is a window into what makes a modern Bratislava tick: the pre-Velvet Revolution setting, dotted with modern takes on traditional beer pubs and second-generation Vietnamese owned stalls, draws local celebrities and work-a-day residents of all ages and economical statuses. There is a mingling of life styles here that represents a culture striving for wealth-driven Central European status while clinging to the nostalgia and simplicity of communism. Vibrant and familiar, though admittedly time-worn, this market offers an experience simply not found at other markets around the city. Hidden pockets of charm: An unattended bicycle hints at an afternoon drink had at one of the market’s traditional pubs. And if social studies isn’t your thing? It’s still worth an afternoon if only for the food! 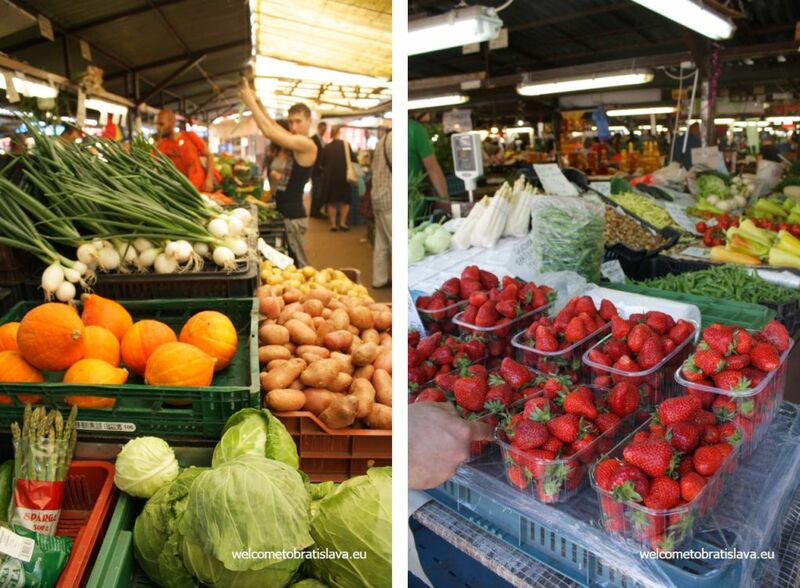 The market space is the largest in BA, accommodating almost 150 seller stands where you can find a great selection of produce and traditional Slovak groceries. It also boasts the biggest selection of cheaper imported goods, mostly clothing and footwear, though we recommend sticking to the cultural and culinary attractions. Enjoy exploring the market on your own or follow along with our small walking (and eating) tour to sample the best Bún Bò Nam Bộ in the city or fill up on langoš and ice cream, because why not? You’re on holiday – or pretending you are. One more thing to mention – you might face some language barriers here. Don’t worry, just point with your finger to what you’d like and don’t forget to smile. There are several entrances into Miletička, but we recommend starting your tour at the main opening where the streets Miletičova and Košická merge. This hectic intersection is your first taste of the dynamic environment that characterizes this market. Business types in hip power-suits wait patiently for the bus next to scruffy teens and shrunken grandmas carrying bags of tomato plants. Looking down Košická you can just make out the top of Apollo Bridge, the architecturally stunning bridge that began its life as a concept in 1973 but only finished in 2005 with the addition of its sophisticatedly arched suspensions. Hefty baskets of walnuts and candied fruit compete with paprika and roasted pumpkin seed vendors for the attention of shoppers. Turning back towards the entrance, you will likely be greeted by requests for spare change or hawkers selling wild mushrooms in the summer and flowers in the spring. Once inside, you can further orient yourself with a crude directory pointing out bathrooms and fire exits. 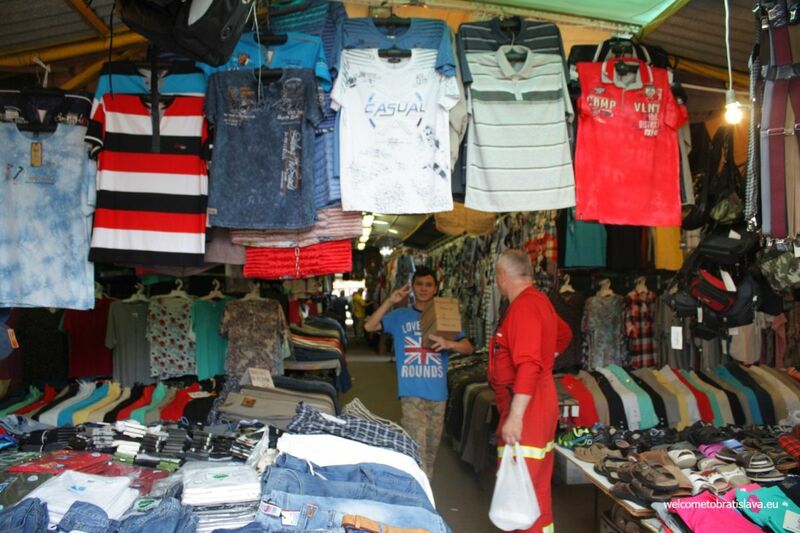 But the basic layout is this: The narrow alleys at the entrance are filled with home good and inexpensive clothing to the left and to the right are stall after stall of flowers sellers leading down the length of the block. The wide thoroughfare ahead is lined with dried chilli, nuts, fruit and – ubiquitous with Slovak open air venues – roasted pumpkin seeds. Padding the outer edges of the market are dozens of traditional beer pubs and wine shops, along with a few noteworthy standouts such as the famous Phong Nam of local hipster fame. The modest drinking spots here exude a “local Slovaks only” vibe and make for better people watching than touresting, though more adventurous types may enjoy testing their language skills on the regional hospitality. Just one note on this: some bars have been rumored to entertain a rougher crowd. But hey, the diversity here is part of the draw. 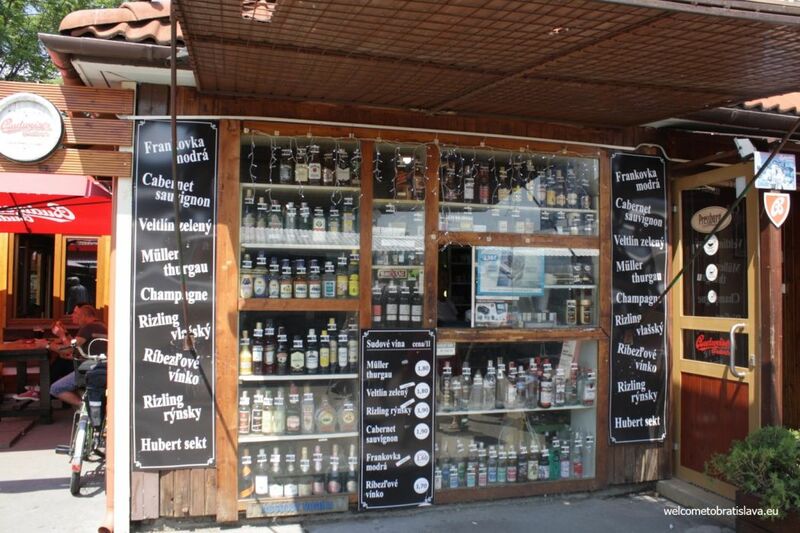 You are never too far from a drink at Miletička: A bottle shop flanks traditional beer pubs and Komzik looms in the distance over a lane of tiny krčmy – Slovak dive bars. Of course, the market itself is the actual main event here. And you can’t miss it. 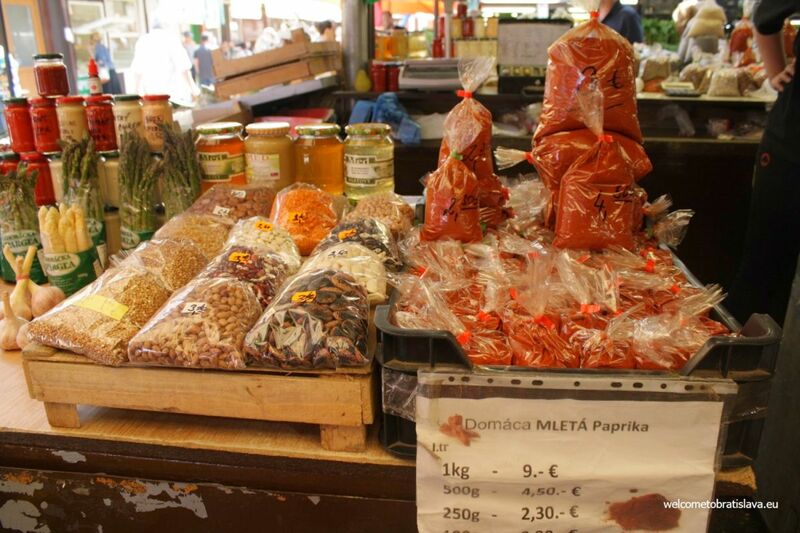 The entire center of Miletička is filled with food stalls stocked six days a week with local produce and goods such as pickles, chili sauce, and eggs. Seasonal fruits are featured so as to be seen first and practically spill off the display counters. While some vendors offer samples, expect to feast with your eyes unless you buy. It’s very tempting to begin your shopping immediately, but we advise not to rush in with an empty stomach. Just ahead of the entrance, to your left, you will see small stánky – stands with slatted wood siding reminiscent of teeny ski lodges. As the lines of market-goers indicate, these shops are where you can score incredible local cheeses, traditionally smoked meats and – most deliciously – ice cream and fried food. But we’re all adults here. Let’s start our afternoon with some ice cream. For a mere euro each, you and your entourage can treat yourselves to hands down some of the best soft-serve money can buy (for a euro). Is it fancy? No way. Made from quality ingredients? Pfff, it’s mostly sugar. Does it remind you of the way summers taste like in your memories of childhood? It comes close. The chocolate and vanilla swirls are surprisingly natural tasting, with hints of coco and the last sip of milk from a bowl of breakfast cereal. Enjoying a sugary (though not too cloying) treat should conjure up nostalgia for visitors and locals alike, but there is Slavik sentimentality ahead. Being portable, walk yourself and your snack to the next stand on our tour – the Langoše shop. Sweet – but not too sweet – swirls of soft-serve bring back childhood memories of summer afternoons, while fried puffs of dough smothered in dairy may create new ones. For those new to the cuisine of central and eastern Europe, Langoše is deep fried leavened dough, sometimes made with potatoes, always loaded with combinations like ketchup and cheese or garlic cream and cheese or bacon and cheese. Cheese, basically, is a favorite topping for this Hungarian street food. While we wouldn’t define this as traditional Slovak food, even in the most throwback sense, this is a dish affectionately associated with the past. Lucky for us, this stand still serves this airy, crispy, savory-sweet darling at retro prices. PS – Wash this down with a Kofola. Yes, it tastes like root beer and Coke had a herbaceous soda baby, but what better way to celebrate a day at an old-school open air Slovak market than with a Socialist era cola? (Slovak beer, obviously – but we’re getting to that). Even before Socialism and it’s stereotypically bleek shopping options, the concept of heading to a grocery store for the majority of your food is surprisingly recent here. 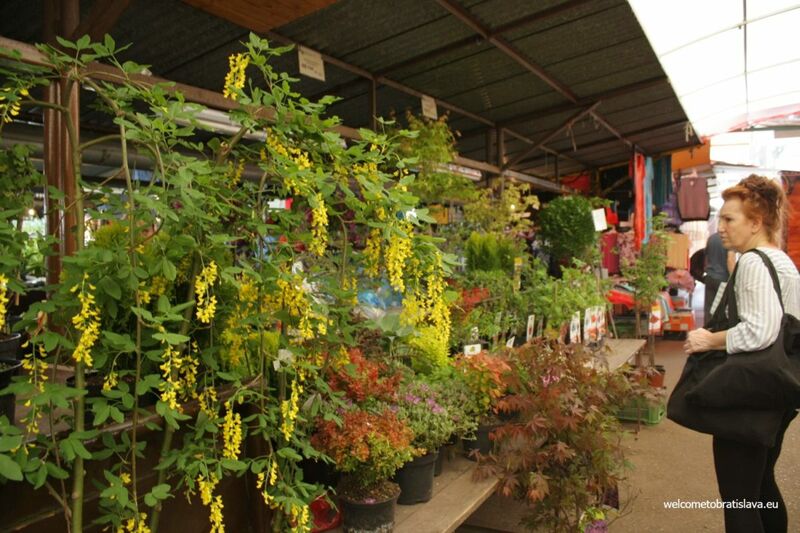 Most Slovaks traditionally lived in villages with access to large gardens or tiny farms. 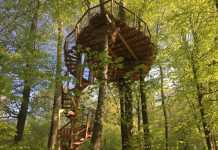 Families would raise their own chickens and rabbits and pigs could be heard squealing away in at least one backyard. In the summer there were sweet peas and peppers, in the winter cabbage and potatoes. Wine and spirits were distilled at home and neighbors supplemented each other with wild game and eggs from their coops. 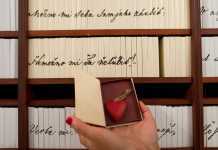 For those living in larger cities, the local market stood in as the source of this edible weath. Today, mega-stores like Tesco Extra may be the most convenient way to shop, but they’re hardly the most charming. So, with your appetite sated and euros burning a hole in your pockets, let’s head in to the main square! There is no best way to explore this vibrant market and we recommend you simply pick a corner to start at and dive in. Fruits and vegetables all but spill off their display tables. Spring and summer are especially abundant times. 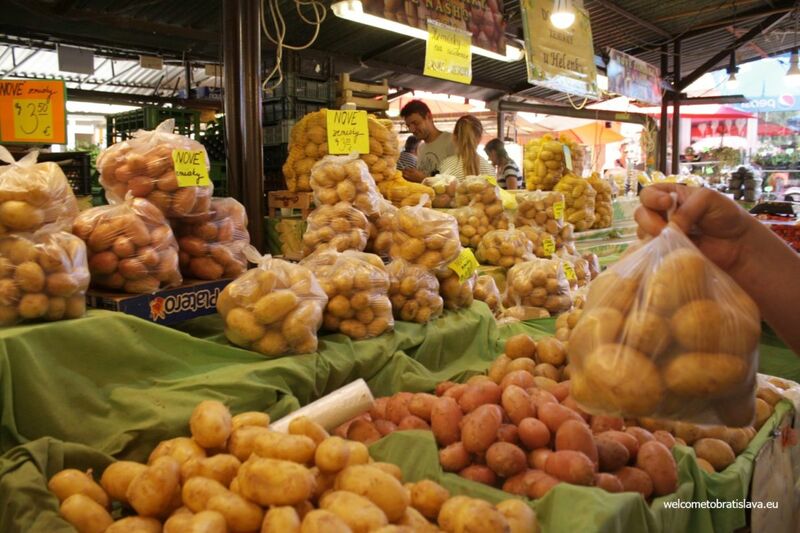 Right away it is noticeable that same variety of fruits and vegetables is sold at most stalls. Pay close attention to where the locals are flocking in order to choose the best of the best. That said, some farmers specialize in their product and take space week after week in the same spot. This enables city-dwellers and tourists a chance to enjoy regional Slovak food, now less available to all than in previous generations. Think artisan pop-up shop, but for potatoes or honey. 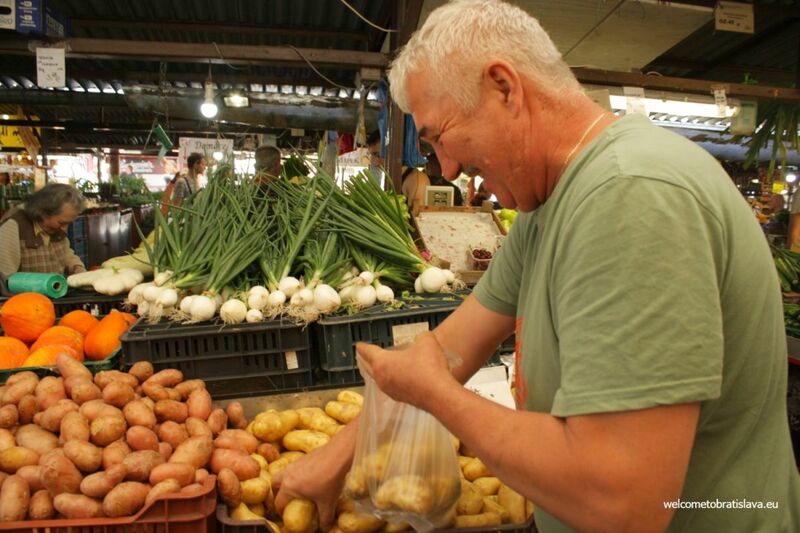 Tomato, potato: Vibrant displays of farm fresh produce delight local shoppers who sneak in a cheeky pose for the camera. The people watching here is almost as delightful as the market itself. Wherever you are, take a moment to look around and capture the atmosphere. 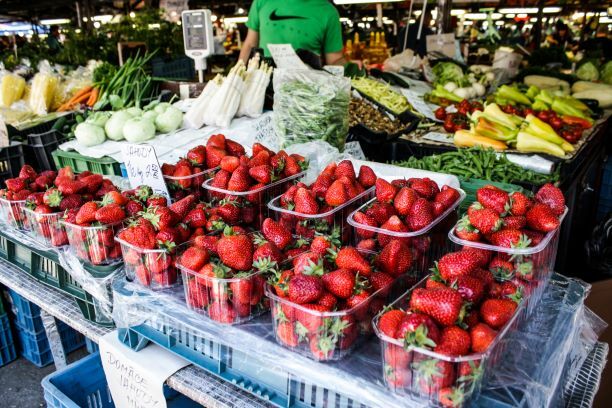 There is human variety here that’s increasingly difficult to find at posher markets, such as the modern Fresh Market up the street or the re-branded Saturday market at SNP. We adore these chic new spots and applaud their commitment to breathing life into the Bratislava food scene, but their innate upscale vibe inevitably attracts BAs wealthier crowd and offers a limited view into local culture. Miletička, by contrast, is low-key and generally inviting for all types: little old ladies doing their daily shopping; tattooed hipsters here for the irony; middle-aged construction workers sneaking in an afternoon beer. 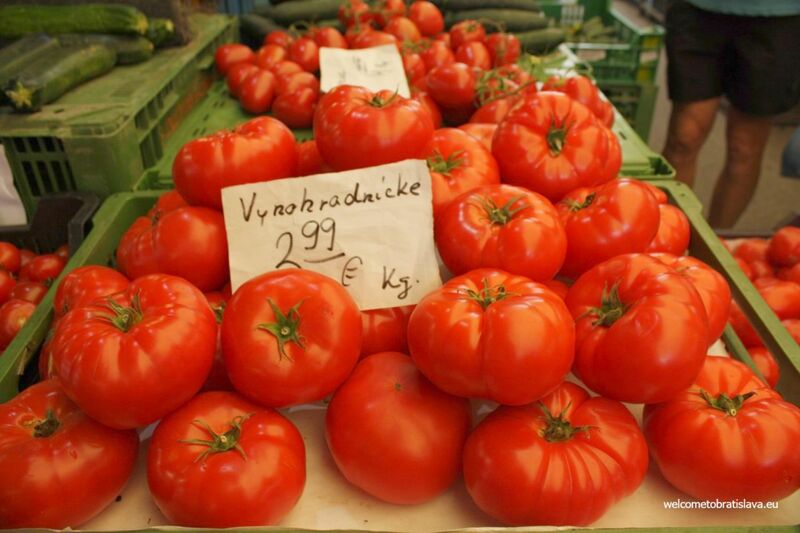 If you’re unable to slip fresh vegetables into your suitcase for the trip home, at least stock up on local specialties. 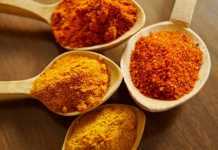 Freshly milled paprika – spicy and smokey – is a trademark flavor in Slovak cooking; regional honey is well known for its quality. By now we assume you’ll be ready for a light lunch. Or second snack, if that helps justify it. While weaving in and out of the crowded pathways, you will have seen another long row of wooden huts towards the south-east of the market. 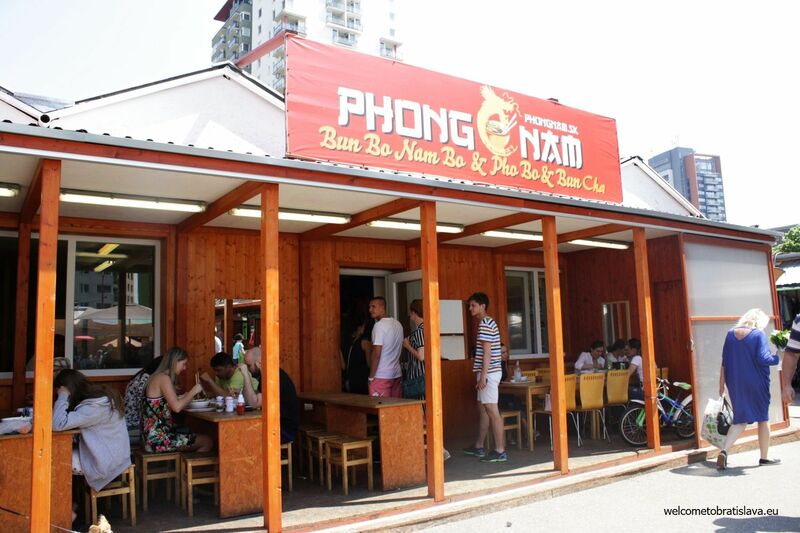 Head back in this direction and welcome yourself to some of the most authentic Vietnamese cuisine in Bratislava. 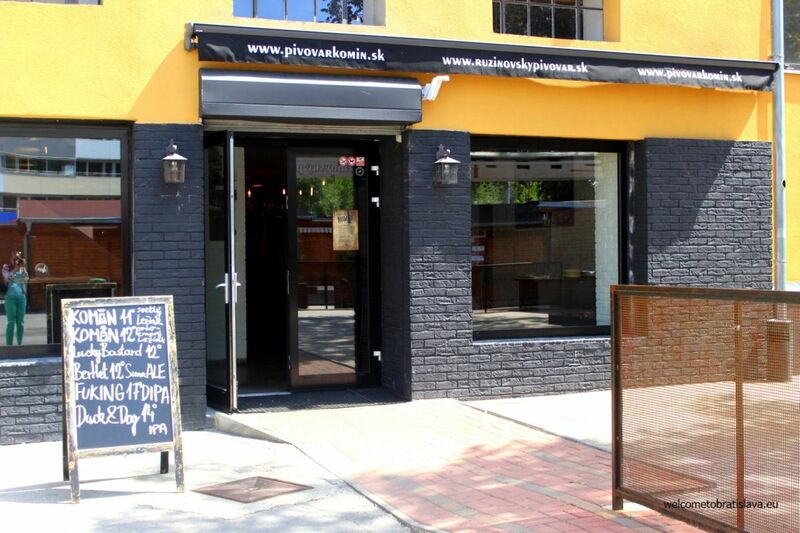 A delightful dichotomy of Miletička is the abundance of Vietnamese owned stalls and restaurants tucked between the traditional Slovak smoked meat shops and beer pubs. However, a closer look at the history of this region and Czechoslovak immigration trends hints at how long-established this community is in Bratislava and the city’s ties to Socialism. And while we won’t side-track into a lecture now, it’s interesting to note that many of the Asian families who own and operate these shops have been living in the region since the 1970s. But let’s get to the food! We caught Phong Nam after the rush, as you can tell by the small line out the door, rather than one roping around the patio. The specialties here are extremely fresh and loaded with big handfuls of mixed herbs and juicy strips of chicken, pork, or beef. Don’t be fooled by the slightly shabby exterior. Or dismayed by the long line that winds out the door, for that matter. It’s all part of the experience. Everything you eat will easily contend for best Asian in Bratislava. The magic really happens when you order Bún Bò Nam Bộ, Bò Xào Đậu or the Pho. Especially the Pho for you soup lovers. 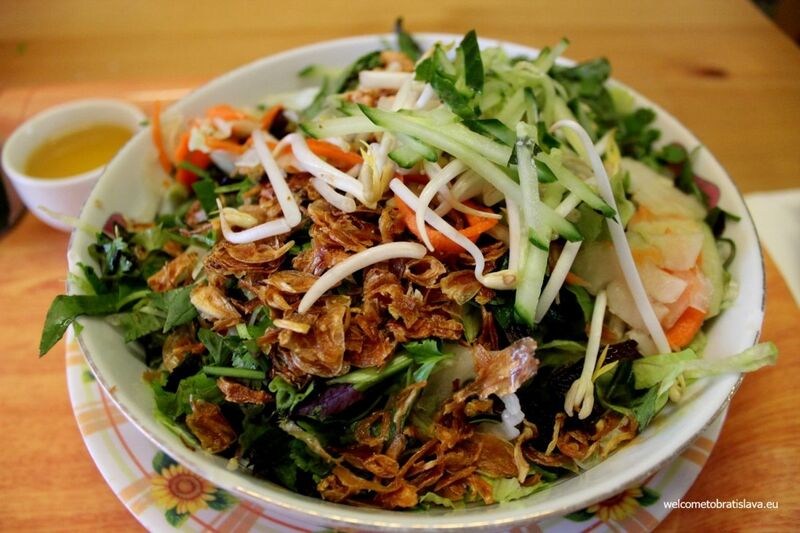 As we have said before, you will be able to enjoy a genuine Vietnamese foodgasm! After enjoying your meal and dong a bit more people watching – this time on the ultra-hipster end of the spectrum – explore the outer edges of the market. Bucket after industrial bucket of pickled peppers, cabbage and fermented cucumbers share this space with potted flowers and deep rows of inexpensive imported goods. For those of you visiting Bratislava from abroad, the merchandise on display is honestly not enticing enough to schlep back home, but this area of the market is worth a look around. Take your time and then make your way north, towards the tall brick chimney. It’s time for beer. The pickle vendors, flower stalls, and flea market goods that hug the back market are shadows of Bratislava’s journey from small communist influenced country to independent free market to, within the past decade, one of the EUs richest cities. Slowly these stands are on the decline as the city races to fill it’s retail spaces with chain stores that reflect the wealth of the West. If you’ve been wondering what is attached to the giant column looming over the market square, it’s time to find out. Visually parallel with the hilltop Kamzik radio tower, Komín’s trademark coal-era chimney is a local landmark and the pub’s namesake – komín means chimney. Beginning it’s life as a small walk-up window for ordering beer, this pub is now an impressive building with a generous capacity – two floors and a summer terrace. Inside, beer is brewed in massive tanks which lends a pleasant, fresh beer fragrance to the whole space. If the patio is full, sitting right where they brew your beer is consolation enough. A chalkboard with beer specials displayed in front of the main entrance. You are welcome to drink inside, but if the weather permits and you can find a spot, better to take advance of the patio for your imbibing needs. 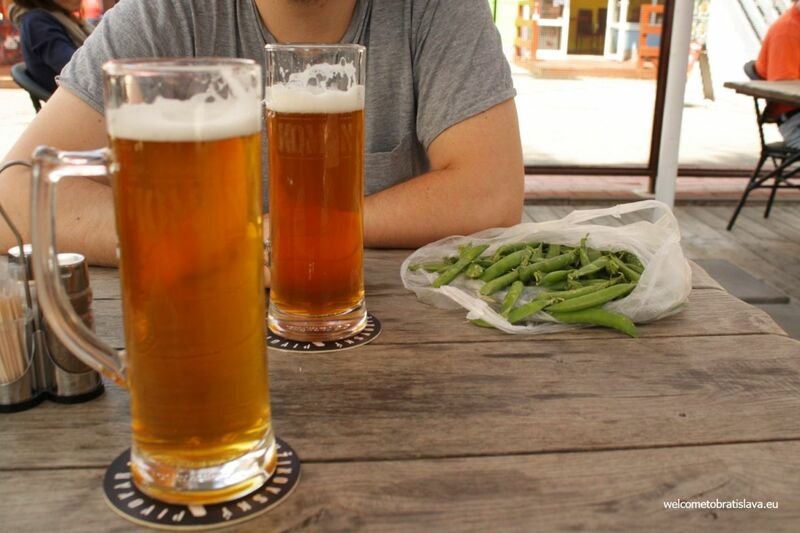 Speaking of beer, really – you’ve earned one after all that eating and shopping. Komín offers three home-brewed beers: light lager, semi-dark lager, and IPA. In warmer months we recommend a Lager style, typical of region with a long and strong tradition in Slovakia. For something with more heft, the IPA is a solid beer with full flavor and just enough hoppiness. Not that you have room for it, but the kitchen serves decent versions of Slovak classics like paté and tartar. Sample the beer cheese, if you dare . 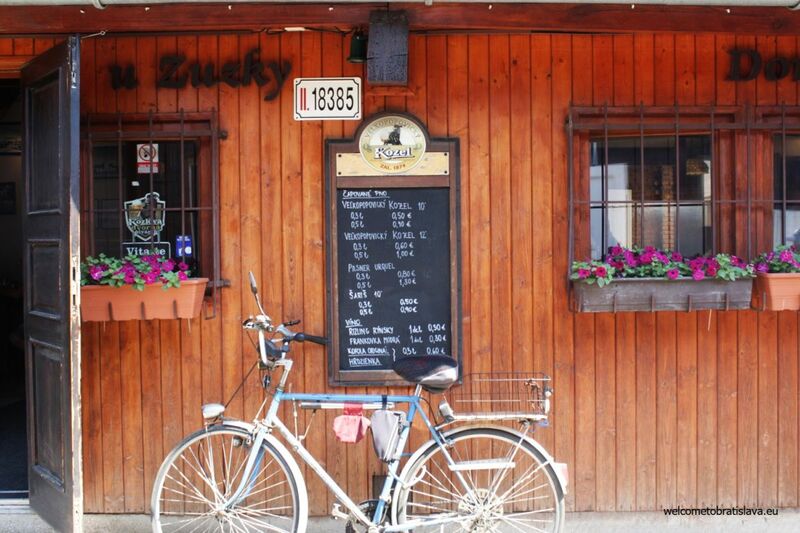 . .
Sip your drink and enjoy the remainder of your productive, culture-filled day in the market’s most charming piváreň. Daydream of where to adventure next. Did we miss any key market spots that should be added to this tour? Let us know so we can check them out!